LEXINGTON, Ky. (April 12, 2018) — From issues surrounding women’s roles in society, sexual identity and ethnicity to a toy’s struggle with the real world, one of the new dances or plays from students in University of Kentucky Department of Theatre and Dance’s “New Works Now” is likely to speak to you. See where 50 years of risk-taking expression and creative process has taken UK’s theatre program April 19-22, at the Guignol Theatre. “New Works Now” will showcase the talents of UK student playwrights, directors, scenic designers and choreographers in a department-wide main stage production of new works. The addition of new dance productions in recent years reflects the growth in the Dance Program at the department in the last seven years, including the recent addition of a major in the field in the last academic year. The show will feature five new plays and two dances each 10 minutes in length selected by a panel of theatre and dance faculty from a pool of around 20 submissions. 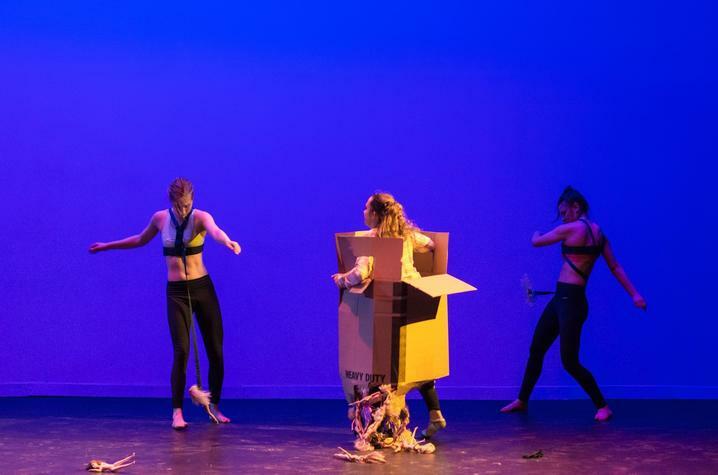 The dance piece “Choking Hazard,” choreographed by Cecilia Pont from Paducah, Kentucky, explores a world in which a woman portrays multiple identities of herself while being confined to the standards society has placed upon her. Audiences will see how the iconic Barbie and three dancers can represent how much pressure is placed on women to look a certain “ideal” way, as well as how they can support one another even through this objectification. The second dance, “Termagent,” choreographed by Caroline Smith, a senior majoring in mathematical economics and minoring in dance from Hurricane, West Virginia, also examines aspects of womanhood. The work explores how women make decisions and how a woman’s idea of self-worth has changed throughout history. In this performance, audience members will witness dancers scream, struggle and live in the roles of different women across generations, as well as confront what it means to be a woman in today’s world. On the theatrical side, two Lexington students will bring the play “The Glass Fortress” to the stage. Written by theatre and philosophy junior Stephen Perry and directed by Isaac Hines-Williams, a junior majoring in theatre and minoring in art history, “The Glass Fortress” is centered on the lead character Kennedy, who recently met up with a friend after years apart. As the play unfolds, Kennedy struggles to piece together the reality of the meeting as judgment and recollection are clouded by anxiety and depression. “Sin Bloomed with the Azaleas” was written by theatre senior Ethan Maguet, of Corbin, Kentucky, and is being directed by theatre sophomore Emily Misali, of Montgomery, Ohio. This Southern drama follows Alex and Logan, two juniors in a Bible Belt high school, who are in a hush-hush relationship. When their secret begins to unearth, the two Kentucky teens struggle to keep their relationship alive in the face of their town’s homophobic culture. Two Louisville theatre seniors, playwright Amy Pan and director Curtis Lipsey III, will stage “Highlighter Girl.” This play follows two sisters as they create a superhero for a creative writing assignment. Along the way, the pair wrestles with facing their world and understanding their complex Asian-American identity. “Prerequisite for Love,” was written by Faith Murphy, a senior majoring in theatre and minoring in creative writing from Cynthiana, Kentucky, and is being directed by theatre and political science junior Treyton Blackburn, of Pikeville, Kentucky. This play finds the lead, Alexis, in love with her best friend, Daisy. The protagonist’s awkward personality prevents her from just asking Daisy out; instead she summons the Greek goddess of love, Aphrodite. Chaos ensues and Alexis learns sometimes things are better off done without the help of deities. A member of Lewis Honors College, scenic designer Jennifer Gould, an art studio and theatre junior from Simpsonville, South Carolina, says she was first drawn to “Prerequisite for Love” for its connection to mythology. But now, Gould says she is more excited about the opportunity the production has given her to collaborate. The teamwork part of the theatre experience is something the studio artist welcomes. “Don’t get me wrong, I love my studio classes, but they always feel so solitary. The great thing about theatre is that I get to work with a team of other people to make something bigger, and in some ways, more impactful, than any art piece that I could make on my own,” Gould said. Finally, the inanimate comes alive in “How/Why My Sock Monkey Became Real,” written by theatre junior Emma Imes, of Flatwoods, Kentucky, and directed by Moniece Mosley, a junior majoring in theatre and minoring in creative writing and African American studies from Louisville. In this play, when toys are loved enough they become real. Now that Socks, the sock monkey, has become real, his best friend Molly is tasked with helping Socks deal with the horrible things he saw before he came to life. While the choreographers, playwrights, directors and scenic designers have many different stories to tell in “New Works Now,” they do agree on one point — how significant this show is to their futures. 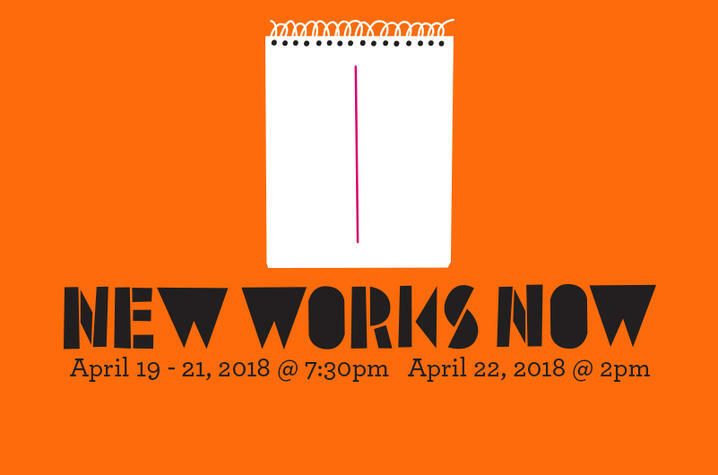 “New Works Now” will take the stage 7:30 p.m. Thursday to Saturday, April 19-21, and 2 p.m. Sunday, April 22, in the Guignol Theatre. Tickets are $5 for UK students with a valid school ID and $10 for general admission. Tickets are available for purchase at the Singletary Center box office, contact the box office at 859-257-4929, and visit online at www.scfatickets.com or purchase in person during standard business hours. A processing fee will be applied to transaction upon purchase. The UK Department of Theatre and Dance at UK College of Fine Arts has played an active role in the performance scene in Central Kentucky for more than 100 years. The department is currently wrapping up its 50 years celebration of offering theatre as a program of study. The students enrolled in the program enjoy hands on training and one-on-one mentorship from the renowned professional theatre faculty. The program is coupled with ongoing career counseling to ensure a successful transition for the students, from campus to professional life.